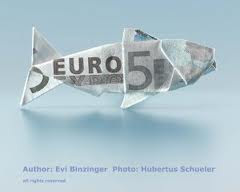 Open Europe: EU Fisheries Commissioner won’t let Greece off the hook. Good spot Anonymous - we've changed that. So one commissioner is actually in touch with reality. Let us hope it is contagious. Greece is insolvent. Greece cannot live with the Euro. Greece needs to default, and to return to its own currency; or if not, to a mediterranean currency taking in Spain and Portugal and Italy. Whatever it is, it is not the euro, and the sooner this happens the better. Ireland should adopt the Pound, perhaps?